Recently in the area where I live, we had a tragic incident involving a carjacking. The victim was shot, so we felt the need to discuss some tactics to help survive a carjack. First of all, avoid it. Maintain your situational awareness. If something doesn’t look right, don’t go there. Listen to news casts before leaving your home, in case there’s some civil unrest in a certain area of town. This will give you the ability to avoid that area(s). Stay tuned in to local crime stats that you can find on most local law enforcement websites. This will help you identify areas of concern, where carjacking are more prevalent or there’s an increased criminal activity. Second, run whenever possible. Maintain a safe distance between your vehicle and the vehicle in front of you. You should always be able to see the bottom of the rear wheels on the vehicle in front of you. This should give you enough distance to turn the wheels to the right or to the left and accelerate away from the situation. There is no need to get bumper to bumper with the vehicle in front of you, and then the vehicle behind you gets up on your bumper. Always keep your vehicle in gear and maintain your situational awareness. Always look for a escape route. Are you ready to drive away, if need be, to protect your own safety or the safety of those in your vehicle? When it comes to escape, think outside the box. If you need to drive up on the curb and drive down the sidewalk to get away, do it. If you need to drive into the oncoming traffic lane to avoid from being killed, do it. You can deal with any traffic violation tickets later, while you’re still alive. Whenever possible, try to keep your vehicle in the center lane next to the yellow line(s). This way you will always have the ability to drive into the oncoming traffic lane and escape, if it is a life-threatening situation. Third, hide if you can. This can be a specially viable, if you have tinted windows. Always keep your doors locked and your windows rolled up. If you find yourself in a situation, where you can’t drive away, staying inside your vehicle offers you some physical protection. Turn off the engine and climb in the backseat and hide on the floorboard. Do whatever you can to remain hidden. Car jacketers are usually in a hurry, and they don’t want to take a lot of time with a vehicle that may be unoccupied or already abandoned with no igntion keys, so they move quickly to another vehicle. Fourth, fight as a last resort. Stay inside your vehicle, as long as it runs it offers you some physical protection and gives you a means of escaping the area. Also, in a deadly force situation the vehicle can be used as a weapon against an attacker. So, if need be and it is legally justified to do so run them down. Remember, at that point in time you’re fighting for your life and the life of your family. If you have a firearm Missouri’s “Castle Doctrine” allows you to use a firearm from inside your vehicle without any duty to retreat. This is why it is so important to select the proper concealed carry holster. It should allow you too quickly draw your firearm while seated in the driver’s seat with the seat belt attached. Let’s face it, this whole thing could happen within second. If your holster does not allow you the ability to access your firearm and bring it up on target within 2 to 3 seconds, it is an ineffective holster. Remember, if you can’t access your firearm, then you don’t have a firearm. You also need to obtain the proper training to effectively engage an attacker from within your vehicle safely and effectively. Range shooting at a paper target from a standing position will not enable you to effectively and safely draw your firearm and use it in a carjacking situation. If you are forced to exit your vehicle, because it becomes disabled try to use the engine block, the tire rims or the overlapping of metal found around the door frames as cover. The definition of cover is anything that will stop a bullet. The definition of concealment is anything that will hide you from an assailant, but it won’t stop a bullet. Be sure you know the difference. Never lay across the hood of your vehicle. You will expose too much of your upper body to your attacker. The objective is to expose as little as possible to your attacker. This means only exposing the barrel of the gun, your eyes and forehead. Another technigue for exposing as little of yourself as possible to your attacker is known as the “peekaboo” technique. This involves squatting down and hiding your entire body behind cover very briefly, then popping up just high enough to expose the barrel of your firearm, your eyes and your forehead to engage the attacker. Once you fired two shots duck back down, move laterally, then pop back up to engage the attacker. This enables you to conceal as much of yourself as possible and make it very difficult for the attacker to engage you, since they have no idea where are you going to pop up again. Furthermore, you need to stay away from the vehicle at least 15 feet. This will be difficult, because your internal personal defense mechanism will motivate you to get as close to the cover as possible. If you do not stand at least 15 feet away from cover, when you engage the threat, rounds from your attacker can hit the hood of your vehicle and deflect up a 18 degree angle. This will cause the round that would have missed to actually hit you in the head. If you stand at least 15 feet away, that same round that deflected up off the hood at an 18 degree angle will fly over your head. 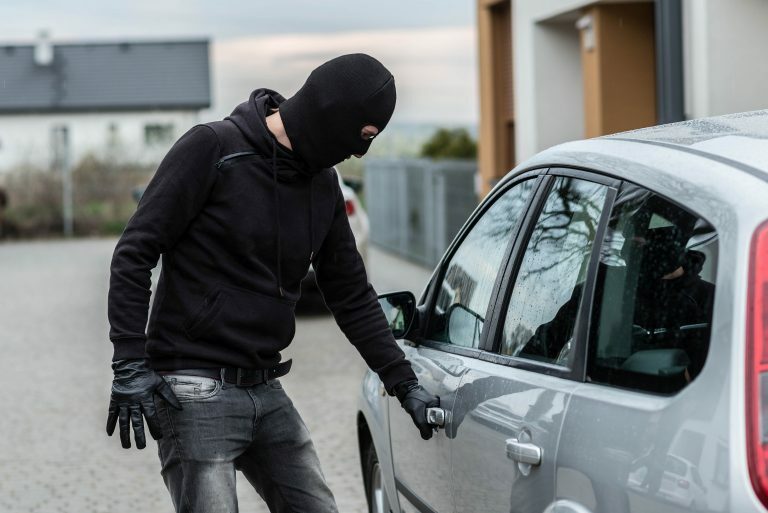 These are some tactics you might want to utilize in your efforts to survive a carjacking or an armed vehicle assault. These are techniques described in text. They give you a better understanding of what you might do to survive a carjacking or armed vehicle assault, but text cannot replaced hands on practical vehicle defensive firearms training. Training is survival and survival is training.